The top US commander in Iraq, General David Petraeus, says he expects to be able to recommend cuts in US forces before he leaves his post in September. Gen Petraeus told a Senate panel he hoped to make the recommendation at the end of a 45-day freeze on withdrawals, which is due to start in July. He would not say how many troops would be withdrawn. The Senate panel is considering Gen Petraeus' nomination to be appointed head of US Central Command. After the latest round of withdrawals is completed in July, the US will have about 140,000 troops in Iraq. 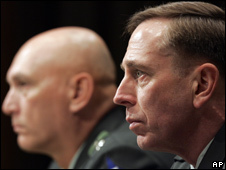 Gen Petraeus played a key role in the Bush administration's "surge" strategy, which has been credited with helping reduce violence in Iraq. He told the Senate panel that security conditions in Iraq had continued to improve despite the withdrawal of three of the five surge brigades and that Iraqi security forces were taking on more responsibility. "Prime Minister Maliki, his government, the Iraqi security forces and the Iraqi people, in addition to our troopers, deserve considerable credit for the positive developments since Ambassador Crocker and I testified a month and a half ago," he said. Gen Petraeus said he did not know if the next withdrawal would be as large as a brigade - a unit of between 3,000 and 5,000 troops. "I do believe that there will be certain assets that... we'll be able to recommend can be either redeployed or not deployed to the theatre in the fall," he said. On Iran, Gen Petraeus told senators the United States should increase pressure on Tehran to counter its rising influence in the Middle East, and should retain the option of military action as a last resort. He has been nominated to take charge of US Central Command, the headquarters responsible for US security interests which covers an area from the Horn of Africa into central Asia and includes all operations in Iraq and Afghanistan. His former deputy in Iraq, Lt-Gen Ray Odierno, has been nominated to replace him in Baghdad. Gen Petraeus has been credited with bringing about progress on both the political and economic fronts in Iraq since he took over as the top commander in February 2007.